Brooke Ishibashi as Neary, Joe Ngo as Chum. Contemporary Americans are a fortunate breed. In our lifetimes and in our homeland, we have not had to face the ravages human deprivation from war or genocide – starting with the degenerate evil of the Holocaust and the massive blood-letting of the eastern front in World War II to today’s ravages in Sudan, Myanmar, and scores of other locales that have not received our attention. One of the most inexplicable was the Cambodian genocide in the 1970s, under the Khmer Rouge regime of Pol Pot. In this small country, over a million were murdered, not because of the usual clashes of ethnicity, religion, politics, or nationality. Although minorities were also targeted, the KR decapitated their own culture – murdering the highly educated cream of the crop – teachers, doctors, artists, clerics, business people – virtually anyone of accomplishment. In frenzied environments like this, regular citizens and potential victims often face moral dilemmas of the highest order that we ignorant innocents can hardly comprehend. In Lauren Yee’s tense and scintillating comedy/drama, Cambodian Rock Band, lead character Chum had escaped Cambodia during the height of the atrocities and resettled in Massachusetts. By 2008, his American born-and-raised daughter has joined an NGO in Cambodia attempting to bring the architects and perpetrators of the Killing Fields to justice. Based on a true story, the NGO is about to prosecute a case against the head of S-21, a torture and extermination center during the terror of the Khmer Rouge. This leader, alias Duch (pronounced doyk), was not in the very top echelons of command and considered himself merely a cog in the machine. Parallel to the trials of high ranking Nazis in Germany following World War II, the key question is at what level of leadership can an official get away with saying “I was just following orders.” And as deplorable as the acts of many were, going all the way to the bottom of the chain of command, what alternatives did they have? What compromises will decent people make to promote their own survival? Joe Ngo sizzles as Chum. His depictions of different phases of Chum’s life are stellar. In the 70s, he transitions from typical rock band member to horrified suspect under interrogation. In current day, his demeanor changes dramatically again to an almost cartoon-like exaggeration as a father. Another acting highlight is Daisuke Tsuji. He portrays the prison commandant Duch. More importantly, he acts as the vibrant emcee. Using this narration device, the playwright advances the plot and provides relief, as the emcee breaks the fourth wall and engages the audience directly . 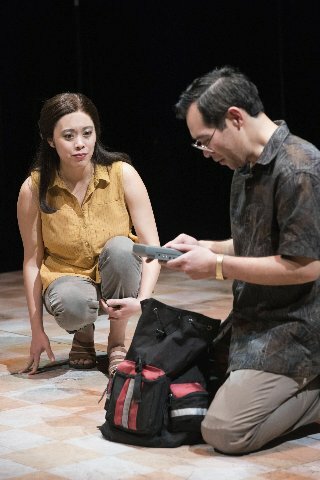 This compelling story reveals an important part of Cambodian history of which most theater goers probably lack significant knowledge. It does so in an entertaining and provocative way. 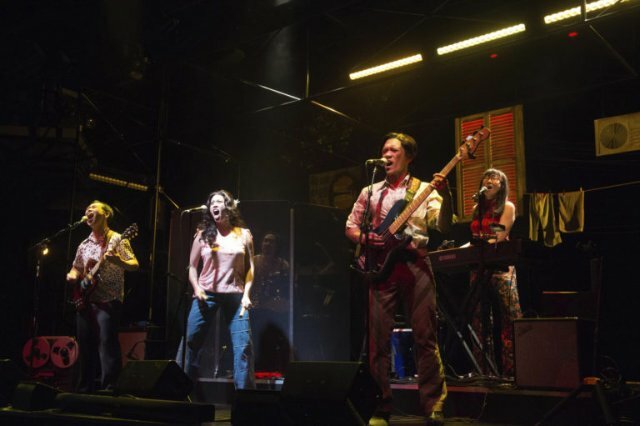 Cambodian Rock Band written by Lauren Yee, with songs by Dengue Fever, is produced by Oregon Shakespeare Festival and plays in repertory at its Thomas Theatre in Ashland, Oregon through October 27, 2019. Courtesy of For All Events.